The San Ramon Valley’s undulating gold and green hills reflect over 200 years of California’s ranching history. When the Spanish first settled Alta California, they brought livestock with them and transformed the landscape. In 1769 about 200 cattle were moved from Baja to Alta California with the first Spanish invasion led by Gaspar de Portola and Father Junipero Serra. Juan Bautista de Anza’s 1775-1776 epoch expedition from New Spain brought the region’s first colonists and about 1000 livestock -- 695 horses and mules and 355 cattle. 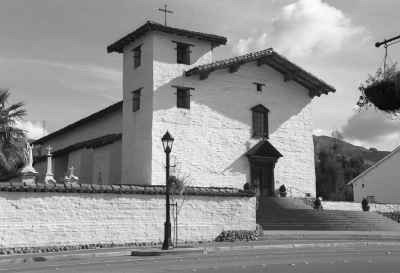 As the 21 California missions were established, each one was allotted a "dowry" of 18 cattle and four swine in addition to horses, sheep, goats, and mules. Descended from animals brought to the Americas by the Spanish two hundred years earlier, these cattle were primarily Longhorn and Corriente breeds. They flourished mightily in Alta California’s congenial landscape and climate. Great herds of cattle and horses covered the California countryside, sustaining the hide and tallow economy of the Hispanic era. These grazing animals changed the environment, replacing the native perennial grasses and herbaceous flowering plants nurtured by the Indians to the annual grasses we know today. Beginning with wild oats, these grasses included annual foxtails, Italian ryegrass, rat-tail fescue, soft chess, cheatgrass, medusa-head and goatgrass. "The seed stuck to the hides and wool of the livestock and from imported feed and ballast accompanying the new livestock in ships’ holds," according to botanist David Amme. The San Ramon Valley was part of Mission San Jose’s land on which cattle and sheep grazed from Fremont north to Concord. In 1832 the Mission reported that they managed 12,000 cattle, 13,000 sheep and 13.000 horses. Of all the northern missions, Mission San Jose baptized the largest number of Indians and produced the most agricultural products. With no fences in place, the free-ranging cattle or vacas (Spanish), evolved into fierce feral animals. Historian Robert Cleland wrote: "The breeding of cattle being the chief occupation of the Californians…it determined their mode of life, the structure of their society, and the size of their ranchos." 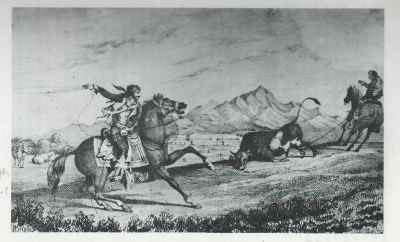 Indian and Spanish vaqueros tended the livestock and were famous for their riding and roping skills. They were the precursors of our American cowboy. After the Mexican Revolution and securalization of the missions, more than 800 ranchos were granted to former soldiers. In the San Ramon Valley, Jose Maria Amador’s Rancho San Ramon covered over 20,000 acres of the San Ramon, Dougherty and Tassajara Valleys with a large headquarters in Dublin. This rancho, which was formally granted to Amador in 1835, was stocked with at least 300 horses, 3,000 sheep and 13,000 head of cattle. Mariano Castro and Bartolome Pacheco received the Rancho San Ramon Valle north of Amador in 1834 which covered two leagues (around 8,000 acres) in today’s Danville and Alamo, southwest of Mount Diablo. Because of the aggressive Indians based on the mountain’s foothills, the rancheros received permission to live elsewhere, coming to the valley for periodic round-ups and cattle slaughters. Cattle hides and tallow were the main trade items and beef was the principal food. Amador’s 150 workers used the leather hides to produce harnesses, saddles, shoes and manufactured furniture as well. He had regular sales contracts for cattle hides (called "California banknotes") and transported them by ox cart over today’s Dublin grade to the Bay. Hispanic Californians were experienced cattle raisers with dry years being the only threat to production. Rodeos, or round-ups were held twice yearly, so that stock could be branded by each owner. Brands were registered and changed only with permission of the governor. A juez de campo, or field judge, settled disputes over the ownership of animals at these rodeos. William Heath Davis listed the largest land and cattle owners of California’s pastoral era and estimated there were 1,220,000 head of cattle on the ranchos. 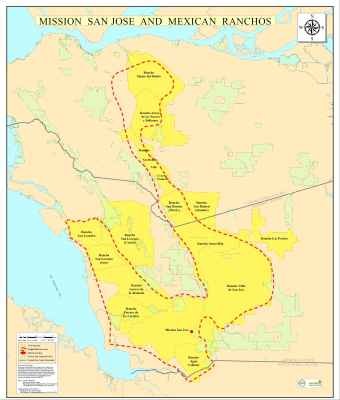 Throughout Alta California, cattle and horses doubled their numbers roughly every two years. Before the Gold Rush, Alta California did, indeed, have cattle on a thousand hills. Ranch" was purchased from Jose Maria Amador in 1851. Amme, David, Grassland Heritage, “Stewardship of a Changed Landscape,” in Bay Nature, April-June 2004. Bolton, Herbert E., Outpost of Empire, New York: Alfred A. Knopf, 1939, p. 161 (number of stock in Anza expedition). California Historical Society magazine, Contested Eden: California Before the Gold Rush (1997). Cleland, Robert Glass, A History of California, The American Period, NY: The Macmillan Co., 1939, p. 38; The Cattle on a Thousand Hills, San Marino, CA: The Huntington Library, 1041. Davis, William Heath, Seventy-five Years in California, SF: John Howell, 1929. Webb, Edith, Indian Life at the Old Missions, Lincoln: U. of Lincoln Press, 1982.